HDFC ERGO General Insurance Company, India’s leading non-life insurer, today announced Delhi Public School, Ruby Park from Kolkata as the winners of HDFC ERGO Insurance Awareness Award Junior Quiz 2018. Samsidh Mount Litera Zee School from Bengaluru claimed the title of first runner up, with Kairali School from Ranchi emerging as the 2nd runner up in the 3rd edition of the Quiz. Launched in 2016, HDFC ERGO’s Insurance Awareness Junior Quiz Award championship is aimed at promoting and spreading insurance literacy amongst school students. Through Junior Quiz, HDFC ERGO reached out to over 54,000 students, imparting basic knowledge on Insurance through townhalls conducted in over 270 schools across the country. Expanding its footprint this year, the Quiz was held in 4 new cities of – Hyderabad, Ahmedabad, Pune and Ranchi along with the existing cities of - Delhi, Mumbai, Kolkata, Chennai and Bengaluru. The Quiz was layered in two rounds – regional level & national level and targeted the students of classes VIII and IX. At the regional level, among the 270 plus schools that participated in the Multiple Choice Question (MCQ) round, 36 schools qualified for the city semi-final round of the Quiz. The winning teams from each of the 9 cities - DAV Public School from Mumbai, Euro International School from Delhi, Bethel MHS School from Chennai, Samsidh Mt. Litera Zee School from Bengaluru, Delhi Public School from Kolkata, Kennedy High School from Hyderabad, St. Kabir (DIN) School from Ahmedabad, Baby’s English High School from Pune and Kairali School from Ranchi then contested for the Championship of the HDFC ERGO Insurance Awareness Award Junior – Quiz at the national level, engaging in an exciting Grand Finale that was held in Mumbai. Each team put up a whole-hearted effort but the Delhi Public School, Ruby Park team from Kolkata took home the title of National Champions and rewards worth Rs.1,50,000/- and the School was awarded Rs 75,000/- prize money. Samsidh Mount Litera Zee School team from Bengaluru claimed the title as 1st runners to grab prizes worth Rs 1,00,000/- with Kairali School team from Ranchi bagging the 2nd runner up position and prizes worth Rs 50,000/-. The other participating team were awarded prizes worth Rs 20,000/- each for their efforts and participation in the Quiz. 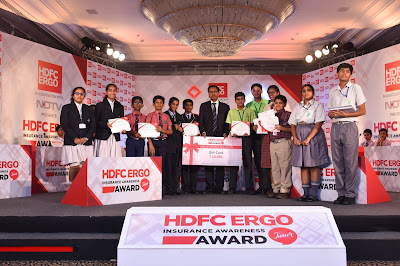 The HDFC ERGO Insurance Awareness Award Junior – Quiz is the first of its kind initiative taken by HDFC ERGO to promote and spread insurance literacy amongst students as a necessary life skill. Enthused by the overwhelming response from the schools, HDFC ERGO looks to expand the Quiz to schools in more cities across the country in the coming years.